Another large building blown at 3.00 PM today. Bit sneaky as only released info to the press 30 mins before . Lets hope they publish in good time when they are going to drop the chimney or there will be a lot of people disappointed. The large Crump/Bang this afternoon was another bit of the Power station buildings demolished. Still a lot to go plus the chimney. These are the best before and after snaps that I took. It looked so much better on the close up video on Meridian news tonight. Kingsnorth Power Station turbine hall being demolished at 13:00 this afternoon, as seen from Sharp's Green. I was expecting the main structure (not the chimney) to go, not just a bit on the side, so I was a little disappointed. I should have researched the layout to understand what the turbine hall was. The main structure still left is the Boiler House Hall. The reason Grain power station is dead looking is because it`s a standby station that is only run up when necessary. It was until recently only oil fired as when built, oil was cheap enough as a fuel. This was a bit short sighted in retrospect. I believe it has now been converted to burn gas as that is handy locally from the newly built Grain gas terminal. It is still dormant and only brought on line after given many hours notice to fire it all up. You can tell when it is running as the outfall into the river will be flowing. And you should see the size of the pumps that move that cooling water! It all comes down to economics - it`s too dammed expensive to run. Time fly's and its charged to your account. 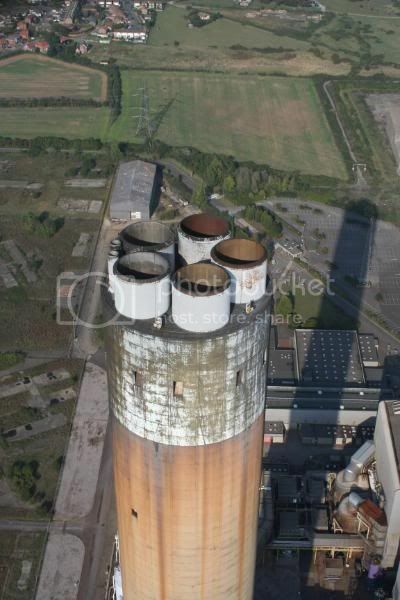 Kingsnorth looked pretty dead to me last year - I wouldn't have flown over the top of the chimney otherwise! Didn't some Greenpeace eco warriers climb it in protest recently? 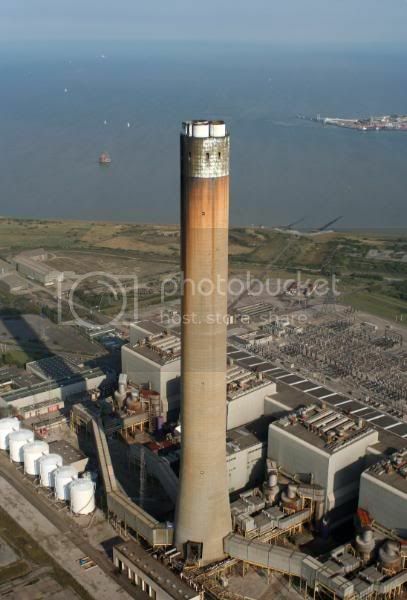 Nice pictures, but Kingsnorth Power Station chimney has only four outlets and is very much in use. In fact, it has GORDON painted at the top. This looks like Grain, which has five. BenGs pic is definately Kingsnorth. 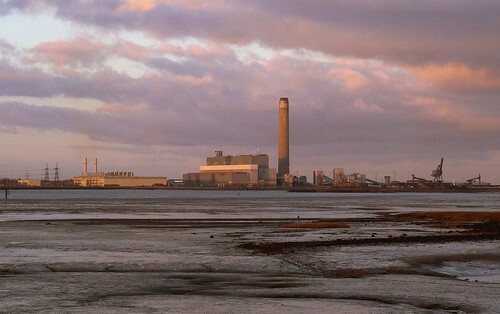 Kingsnorth looked pretty dead to me last year - I wouldn't have flown over the top of the chimney otherwise! Didn't some Greenpeace eco warriors climb it in protest recently?